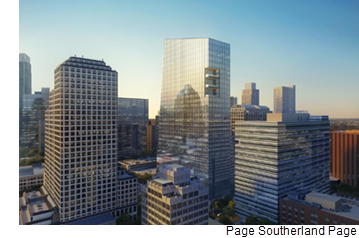 ​​​ AUSTIN – Indeed Inc. has inked a 307,000-sf lease at a future 36-story downtown office tower, and plans to hire 3,000 people in Austin over the next several years. Indeed will lease the top ten floors of Block 71, the office tower under construction at the intersection of Sixth St. and Colorado Ave. by the Trammell Crow Company. The company, which also has a downtown office at 201 W. Fifth St., will consolidate its downtown operations into Block 71. Construction on the tower will be complete in 2021. The 36-story skyscraper will be the largest office tower in Austin, at 709,000 sf, as well as the tallest, rising 554 feet. There will also be 1,500 parking spaces in both below-ground and above-ground structured garages. ​See also​: Austin-Round Rock Office Market Research.